Sárkánytartás házilag: Smaug pusztasága 2013.12.13. Óriáspókok, törp-tünde románc és aranytenger vár, drágaszágom! The Hobbit: The Desolation of Smaug is a 2013 epic high fantasy adventure film directed by Peter Jackson and produced by WingNut Films in collaboration with New Line Cinema and Metro-Goldwyn-Mayer. It was distributed by Warner Bros. Pictures and is the second installment in the three-part film series based on the novel The Hobbit by J. R. R. Tolkien. The film was preceded by An Unexpected Journey (2012) and followed by The Battle of the Five Armies (2014); together they operate as a prequel to Jackson's The Lord of the Rings film trilogy. 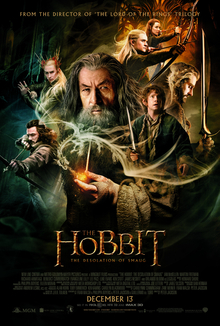 The film follows the titular character Bilbo Baggins as he accompanies Thorin Oakenshield and his fellow dwarves on a quest to reclaim the Lonely Mountain from the dragon Smaug. The film also features the vengeful pursuit of Azog the Defiler and Bolg, while Gandalf the Grey investigates a growing evil in the ruins of Dol Guldur. The ensemble cast includes Ian McKellen, Martin Freeman, Richard Armitage, Benedict Cumberbatch, Evangeline Lilly, Lee Pace, Luke Evans, Ken Stott, James Nesbitt, and Orlando Bloom. Fran Walsh, Philippa Boyens, Peter Jackson and Guillermo del Toro wrote the screenplay. The films were shot simultaneously in 3D at a projection rate of 48 frames per second, with principal photography taking place around New Zealand and at Pinewood Studios. Additional filming took place throughout May 2013. The Hobbit: The Desolation of Smaug premiered on 2 December 2013 in Los Angeles and was released internationally on 11 December 2013 in both conventional and IMAX theatres. The film received generally positive reviews and grossed over $958 million at the worldwide box office, surpassing both The Fellowship of the Ring and The Two Towers, making it the fourth highest-grossing film of 2013 and the 45th highest-grossing film of all time. At the 86th Academy Awards, the film received nominations for Best Visual Effects, Best Sound Editing, and Best Sound Mixing. Benedict Timothy Carlton Cumberbatch (London, 1976. július 19. –) angol színész, aki egyaránt elismert színházi, televíziós, mozifilmes és rádiós szerepei által. Sok híres filmben játszott szerepet (pl. : A szabadság himnusza (2006), Vágy és vezeklés (2007), Suszter, szabó, baka, kém (2011), 12 év rabszolgaság (2013)), de kétségkívül a BBC modern Sherlock Holmes adaptációjában a Sherlock (televíziós sorozat) filmsorozatban játszott főszerepe miatt lett ismert világszerte. Benedict sokoldalú színész, különleges hangját sokféle módon kamatoztatja: többször narrátorkodott filmekben, videójátékokban, valamint időről-időre a rádióban is hallható a BBC különböző rádiós sorozataiban, de szívesen vállalkozik akár reklámok alámondására is. Több filmben is szerepelt és olyan neves színészekkel, mint Gary Oldman, Colin Firth, Julia Roberts vagy Meryl Streep. 2011-ben két Oscar díjra jelölt filmben is szerepelt, Steven Spielberg Hadak útján című filmjében, mint Stewart őrnagy, illetve a Suszter, szabó, baka, kém című filmben, mint Peter Guilamm. 2012-ben, 2013-ban és 2014-ben Peter Jackson Hobbit-trilógiájában kapott szerepet, Smaugnak, a sárkánynak valamint a Dol Guldur-i fekete mágusnak, Sauronnak kölcsönözte a hangját. 2013-ban több nagy filmben is szerepelt. Ő játszotta a J. J. Abrams rendezte, Sötétségben – Star Trek című film fő gonoszát Khant, de szerepelt a 12 év rabszolgaság című - 2014-ben a legjobb filmnek járó Oscar díjjal jutalmazott - filmben, illetve Julian Assange-t, a WikiLeaks alapítóját alakította a "The Fifht Estate" című filmben. A Sherlock sorozat népszerűségének köszönhetően egyike lett a legelfoglaltabb színészeknek. Az elkövetkező években szerepei széles skálán mozognak majd és olyan hírességeket személyesíthet meg a filmvásznon, mint az Enigmát feltörő híres matematikus Alan Turing, vagy a Beatles zenekar legendás menedzsere, Brian Epstein. Benedict Timothy Carlton Cumberbatch was born and raised in London, England. His parents, 'Wanda Ventham' (qv) and 'Timothy Carlton' (qv) (Timothy Carlton Congdon Cumberbatch), are both actors. He is a grandson of submarine commander Henry Carlton Cumberbatch, and a great-grandson of diplomat Henry Arnold Cumberbatch CMG. Cumberbatch attended Brambletye School and Harrow School. Whilst at Harrow, he had an arts scholarship and painted large oil canvases. It's also where he began acting. After he finished school, he took a year off to volunteer as an English teacher in a Tibetan monastery in Darjeeling, India. On his return, he studied drama at Manchester University. He continued his training as an actor at the London Academy of Music and Dramatic Art graduating with an M.A. in Classical Acting. By the time he had completed his studies, he already had an agent. Cumberbatch has worked in theatre, television, film and radio. His breakthrough on the big screen came in 2004 when he portrayed 'Stephen Hawking' (qv) in the television movie _Hawking (2004) (TV)_ (qv). In 2010, he became a household name as Sherlock Holmes on the British television series _"Sherlock" (2010)_ (qv). In 2011, he appeared in two Oscar-nominated films - _War Horse (2011)_ (qv) and _Tinker Tailor Soldier Spy (2011)_ (qv). He followed this with acclaimed roles in the science fiction fiction film _Star Trek Into Darkness (2013)_ (qv), the Oscar-winning drama _12 Years a Slave (2013)_ (qv), _The Fifth Estate (2013)_ (qv) and _August: Osage County (2013)_ (qv). In 2014, he portrayed 'Alan Turing' (qv) in _The Imitation Game (2014)_ (qv) which earned him a Golden Globe, Screen Actors Guild Award, British Academy of Film and Television Arts and an Academy Award nominations for Best Actor in a Leading Role. Cumberbatch was appointed Commander of the Order of the British Empire (CBE) by Queen Elizabeth II in the 2015 Birthday Honours for his services to the performing arts and to charity. Cumberbatch's engagement to theatre and opera director Sophie Hunter, whom he has known for 17 years, was announced in the "Forthcoming Marriages" section of The Times newspaper on November 5, 2014. On February 14, 2015, the couple married at the 12th century Church of St. Peter and St. Paul on the Isle of Wight followed by a reception at Mottistone Manor. They have one child, a son (b. 2015). Sir Ian Murray McKellen (Burnley, Anglia, 1939. május 25. –) angol producer, forgatókönyvíró, színész és filantróp. Hosszú karrierjét elismerték már Golden Globe-díjjal, Tony-díjjal, Európai Filmdíjjal, San Sebastián Nemzetközi Filmfesztivál díjjal, valamint négy Emmy-, négy BAFTA- és két Oscar-díj jelölést is magáénak tudhat. Filmes munkássága mellett színházi tevékenysége is rendkívül jelentős, gyakran szerepel Shakespeare-darabokban. A nemzetközi közönség a mozivászonról – elsősorban Gandalfként a Gyűrűk Ura- és a Hobbit-trilógiákból, valamint Magnetóként az X-Men-filmekből – ismerheti. Egyik alapító tagja a Stonewallnak, amely az Egyesült Királyságban a legnagyobb LMBT jogi csoport, és amelynek ma is gyakori szóvivője. Emellett más hasonló csoportnak is tiszteletbeli tagja. A Brit Birodalom Rendje (CBE) 1979-ben lovaggá ütötte. 1991-ben II. Erzsébet brit királynő szűk körének tagja lett, a New Year Honours tüntette ki „nemzeti jelentőségű szolgálataiért”, majd 2008-ban becsületrenddel is díjazták. Ian Murray McKellen was born on May 25, 1939 in Burnley, Lancashire, England, to Margery Lois (Sutcliffe) and Denis Murray McKellen, a civil engineer. He is of Scottish, Northern Irish, and English descent. During his early childhood, his parents moved with Ian and his sister Jean to the mill town of Wigan. It was in this small town that young Ian rode out World War II. He soon developed a fascination with acting and the theater, which was encouraged by his parents. They would take him to plays, those by 'William Shakespeare (I)' (qv), in particular. The amateur school productions fostered Ian's growing passion for theatre. When Ian was of age to begin attending school, he made sure to get roles in all of the productions. At Bolton School in particular, he developed his skills early on. Indeed, his first role in a Shakespearian play was at Bolton, as Malvolio in "Twelfth Night". Ian soon began attending Stratford-upon-Avon theater festivals, where he saw the greats perform: 'Laurence Olivier' (qv), 'Wendy Hiller (I)' (qv), 'John Gielgud' (qv), 'Ralph Richardson (I)' (qv) and 'Paul Robeson (I)' (qv). He continued his education in English Drama, but soon it fell by the wayside as he concentrated more and more on performing. He eventually obtained his Bachelor of Arts in 1961, and began his career in earnest. McKellen began working in theatre over the next few years. Very few people knew of Ian's homosexuality; he saw no reason to go public, nor had he told his family. They did not seem interested in the subject and so he saw no reason to bring it up. In 1988, Ian publicly came out of the closet on the BBC Radio 4 program, while discussing 'Margaret Thatcher (I)' (qv)'s "section 28" legislation which would make the "public promotion of homosexuality" a crime. It was reason enough for McKellen to take a stand, and he has been active in the Gay Rights movement ever since. Ian resides in Limehouse, where he lives with his lover of 8 years, 'Sean Mathias' (qv). The two worked together on the film _Bent (1997)_ (qv). To this day, McKellen works mostly in theater, and was knighted by 'Queen Elizabeth II' (qv) in 1990 for his efforts in the arts. However, he has managed to make several quite successful forays into film. He has appeared in several productions of Shakespeare's works including his well received _Richard III (1995)_ (qv), and in a variety of other movies. However, it has only been recently that his star has finally begun to shine in the eyes of North American audiences. Roles in various films, _Cold Comfort Farm (1995) (TV)_ (qv), _Apt Pupil (1998)_ (qv) and _Gods and Monsters (1998)_ (qv), riveted audiences. The latter, in particular, created a sensation in Hollywood, and McKellen's role garnered him several of awards and nominations, including a Golden Globe and an Oscar nod. McKellen continues to work extensively on stage... solidifying his role as 'Laurence Olivier' (qv)'s worthy successor, having recently scored hits in the London productions of "Peter Pan" and 'Noel Coward' (qv)'s "Present Laughter". J. R. R. Tolkien, teljes nevén John Ronald Reuel Tolkien (Bloemfontein, Oranje Szabadállam, 1892. január 3. – Bournemouth, Anglia, 1973. szeptember 2.) angol író, filológus, egyetemi professzor. Az Oxfordi Egyetemen az angolszász nyelv professzora 1925 és 1945 között, és az angol nyelv és irodalom professzora 1945-től 1959-ig, de neve a nagyközönség körében inkább írói és költői munkái miatt ismert. A tudományos életen kívül Tolkient leggyakrabban A Gyűrűk Ura, valamint az ezt megelőző A hobbit (Szobotka Tibor eredeti fordításában A babó) szerzőjeként ismerik. Középfölde eredetével és történelmével foglalkozó könyve, A szilmarilok szintén igen ismert. E művek folyamatos és időtálló népszerűsége alapozta meg Tolkien hírnevét a modern fantasy atyjaként. Kevéssé ismert művei közé tartoznak A sonkádi Egyed gazda, A woottoni kovácsmester, a Bombadil Toma kalandjai, valamint a Kóborló és a varázsló című, prózai vagy verses mesék, utóbbi történeteket főként gyermekeinek írta. Ezeken túl számos tudományos munkája kapcsolódik a Beowulf, Sir Gawain és a Zöld Lovag témákhoz. Az „Inklings” („Tintafiak”) irodalmi vitakörhöz tartozott és közeli barátságban állt C. S. Lewis-szal, a Narnia krónikái szerzőjével. Martin John C. Freeman (Aldershot, Anglia, 1971. szeptember 8. –) angol színész. Ismertebb szerepei Tim Canterbury a BBC Golden Globe-díjas vígjátéksorozatában, A hivatalban, John az Igazából szerelemben, Arthur Dent a Douglas Adams-féle Galaxis útikalauz stopposoknak filmváltozatában, dr. Watson a BBC Sherlock című sorozatában és Paul Maddens a Karácsonyi misztériumban, valamint Zsákos Bilbó a Peter Jackson által rendezett A hobbit című új-zélandi filmtrilógiában. Orlando Jonathan Blanchard Bloom (Canterbury, 1977. január 13. –) angol színész. Miután a Gyűrűk ura-filmekben (2001–2003) Legolas szerepével ismertté vált, további fantasy és történelmi témájú művekben szerepelt. Legolasként feltűnt A hobbit-trilógia két részében is, valamint Will Turnert alakította A Karib-tenger kalózai filmsorozatban (2003–2017). A 2004-es Trója című filmben Parisz herceget formálta meg. A 2000-es évek második felétől főszerepeket is kapott, például Ridley Scott Mennyei királyság (2005) című rendezésében vagy a szintén 2005-ös Elizabethtown című tragikomédiában. 2007-ben debütált hivatásos színpadi színészként, 2013-ban a Rómeó és Júlia Broadway-változatában alakította a férfi címszereplőt. 2009-től az UNICEF jószolgálati nagykövete, 2015-ben Britannia-díjat kapott. Orlando Jonathan Blanchard Bloom was born in Canterbury, Kent, England on January 13, 1977. His mother, Sonia Constance Josephine (Copeland), was born in Kolkata, India, to an English family then-resident there. The man he briefly knew as his father, Harry Bloom, was a legendary political activist who fought for civil rights in South Africa. But Harry died of a stroke when Orlando was only four years old. After that, Orlando and his older sister, 'Samantha Bloom' (qv), were raised by their mother and family friend, Colin Stone. When Orlando was 13, Sonia revealed to him that Colin was actually his biological father. Orlando attended St. Edmunds School in Canterbury but struggled in many courses because of dyslexia. He did embrace the arts, however, and enjoyed pottery, photography and sculpturing. He also participated in school plays and was active at his local theater. As a teen, Orlando landed his first job: he was a clay trapper at a pigeon shooting range. Encouraged by his mother, he and his sister began studying poetry and prose, eventually giving readings at Kent Festival. Orlando and Samantha won many poetry and Bible reciting competitions. Then Orlando, who always idolized larger-than-life characters, gravitated towards serious acting. At the age of 16, he moved to London and joined the National Youth Theatre, spending two seasons there and gaining a scholarship to train with the British American Drama Academy. Like many young actors, he also auditioned for a number of television roles to further his career, landing bit parts in British television shows _"Casualty" (1986)_ (qv), _"Midsomer Murders" (1997)_ (qv) and _"Smack the Pony" (1999)_ (qv). He also appeared in the critically acclaimed movie _Wilde (1997)_ (qv). He then attended the Guildhall School of Music and Drama. It was there, in 1998, that Orlando fell three stories from a rooftop terrace and broke his back. Despite fears that he would be permanently paralyzed, he quickly recovered and returned to the stage. As fate would have it, seated in the audience one night in 1999 was a director named 'Peter Jackson (I)' (qv). After the show, he met with Orlando and asked him to audition for his new set of movies. After graduating from Guildhall, Orlando began work on the "Lord of the Rings" trilogy, spending 18 months in New Zealand bringing to life "Legolas", a part which made him a household name. Today, he is one of the busiest and most sought-after actors in the industry. Richard Crispin Armitage (born 22 August 1971) is an English film, television, theatre and voice actor. He received recognition in the UK with his first leading role as John Thornton in the British television programme North & South (2004). His role as dwarf prince and leader Thorin Oakenshield in Peter Jackson's film trilogy adaptation of The Hobbit brought him international recognition. Other notable roles include John Proctor in Yaël Farber's stage production of Arthur Miller's The Crucible, Francis Dolarhyde in the American TV series Hannibal, Lucas North in the British TV drama Spooks, John Porter in the British TV drama Strike Back, Daniel Miller in the EPIX spy series Berlin Station and Guy of Gisborne in the British TV drama Robin Hood. He voiced Trevor Belmont in the Netflix adaptation of Castlevania. After graduating from the London Academy of Music and Dramatic Art (LAMDA), Armitage initially sought theatre work and was a member of the Royal Shakespeare Company (RSC). He turned to film and television roles when he noticed that leading stage roles went to actors with name recognition who could bring in patrons to fill venues. After twelve years away and having earned that name recognition, Armitage returned to the stage in 2014 taking his first leading role in a major production. He played John Proctor in the successful and critically acclaimed production of The Crucible at The Old Vic, and earned an Olivier Award nomination for Best Actor. One of Armitage's trademarks is his baritone voice, which he has employed as a voice actor since 2006. While working on the TV series Robin Hood, he was asked to record audiobooks for the first season of that series. Armitage has recorded several audiobooks and has worked as a narrator on TV and radio shows and adverts. Richard Crispin Armitage was born and raised in Leicester, England, to Margaret (Hendey), a secretary, and John Armitage, an engineer. He attended Pattison College in Binley Road, Coventry, and studied at LAMDA (the London Academy of Music and Dramatic Art). His first appearance on the screen was in a small role in _This Year's Love (1999)_ (qv), but it was _"Sparkhouse" (2002)_ (qv) that gave him a break-through role as the charming but a bit odd character of John Standring opposite 'Sarah Smart (I)' (qv). After two guest-roles in _"Cold Feet" (1997)_ (qv) in 2003 and _"Between the Sheets" (2003)_ (qv), he landed a role as Steven in _Frozen (2005/I)_ (qv), which eventually led him to play the lead role in the big hit BBC drama _"North & South" (2004)_ (qv). Other than appearing on screen, he has also appeared on stage--in, for example, Macbeth and Hamlet. Új-Zéland két nagyobb és számos kisebb szigetből álló állam a Csendes-óceán délnyugati részén. Földrajzilag a Föld legelszigeteltebb állama: még Ausztráliától is kb. 1500 km-re fekszik. A másik legközelebbi nagyobb szárazföld délen az Antarktisz. Északon Új-Kaledónia, a Fidzsi-szigetek és Tonga szigetek helyezkednek el viszonylag közel. Területe Magyarország területének majdnem háromszorosa. Mivel igen távol esik minden földrésztől, Új-Zéland a legutolsó nagyobb, emberi letelepedésre alkalmas terület, amit az ember általában – a maorik révén –, majd pedig az európai ember meghódított. A hosszú elszigeteltség miatt Új-Zélandon az állatok és a növények különleges biodiverzitása alakult ki, igen sok endemikus, csak itt élő fajjal. Ezek közül a legismertebbek a különleges madárfajták. Az ország geológiailag rendkívül aktív területen fekszik, az itt húzódó törésvonalak mentén gyakoriak a földrengések és a vulkanikus kitörések. A polinéziai bevándorlók a 13. század környékén telepedtek le először a szigeten, létrehozva az egyedi maori kultúrát. 1642-ben Abel Janszoon Tasman holland felfedező lett az első európai, aki megpillantotta a szigetet. Hosszú szünet után 1769-ben James Cook brit felfedező hajózott erre, és ő térképezte fel a szigetek fő körvonalait. Ezután európai bálnavadász, fókavadász és kereskedőhajók jártak erre. Elterjesztették a szigeteken a burgonyát és a puskákat, ezek az új ismeretek átalakították a maori társadalmat, súlyosbították a törzsi háborúkat a 19. század elején. 1840-ben a britek és a maorik aláírták a waitangi szerződést, amelynek következményeként Új-Zéland brit gyarmattá vált. A bevándorlók számával együtt szaporodtak a konfliktusok is. A válságokat politikai reformok követték, amelyek során a nők itt kaptak először a világon szavazati jogot. Az 1930-as évektől már jóléti társadalmat hoztak létre. A második világháború után Új-Zéland csatlakozott Ausztráliához és az Egyesült Államokhoz az ANZUS biztonsági szerződésen keresztül, amelyet később az USA felbontott, mivel Új-Zéland felvette a nukleáris mentes irányelvet. Az 1950-es években Új-Zélandon volt a világon a legjobb az életminőség, azonban 20 évvel később a gazdasága hanyatlásnak indult az olaj gyengesége miatt, illetve az Egyesült Királyság Európai Gazdasági Közösségbe való belépésének eredményeképpen. Jelentős gazdasági átalakuláson esett át az ország az 1980-as években, amely során a protekcionista gazdálkodást felváltotta a szabad kereskedelmi gazdálkodás. Az egyetlen, domináns exportcikküket, a gyapjút, felváltották a tejtermékek, a hús és a bor. 2015-ben a vezető exportcikk a sűrített tej volt, ezt követte a birka- és kecskehús, a fagyasztott marhahús, a vaj és a nyers fa. Hivatalos nyelvei az angol, a maori és az új-zélandi jelnyelv.